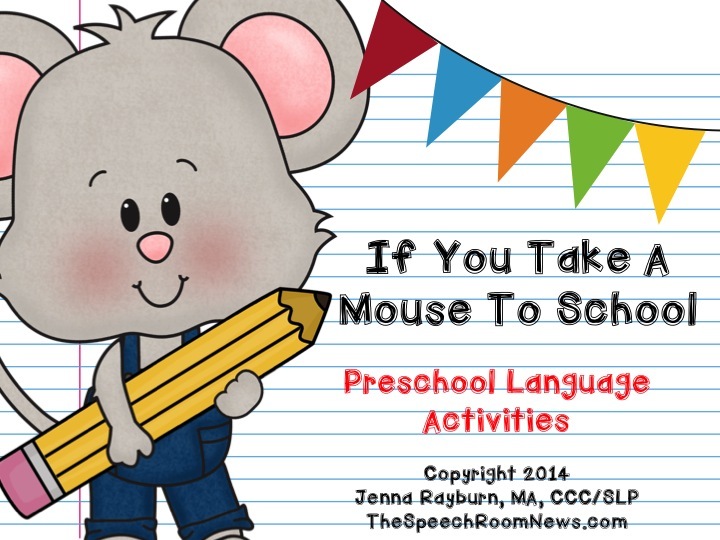 If you take a mouse to speech, I guarantee you’ll have a blast. Popping in today to share it with you my latest book companions. 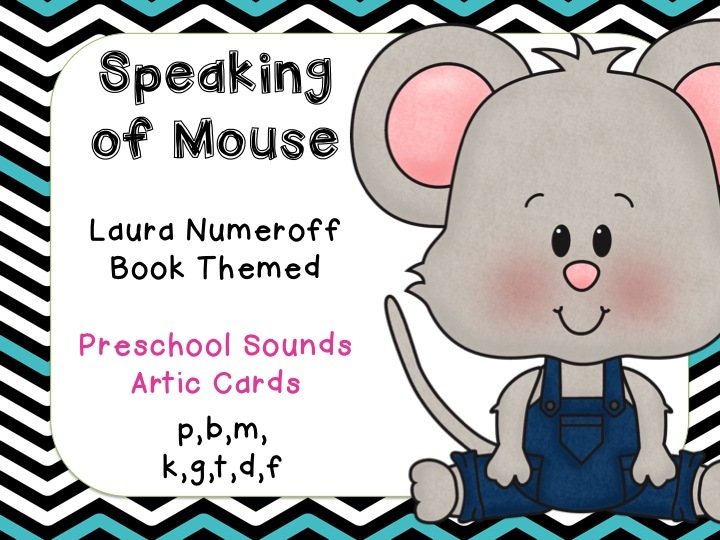 This download is a book companion for the Laura Numeroff book, Take A Mouse to School. The book companion is developed for Preschool and very early Elementary aged students. The book is not included. Pages 3-5: Sequencing: Use page 3 to retell the story. Cut apart the pictures on page 4 and have students sort them in order onto page 5. Make it easier by pre-sorting some of the pictures. 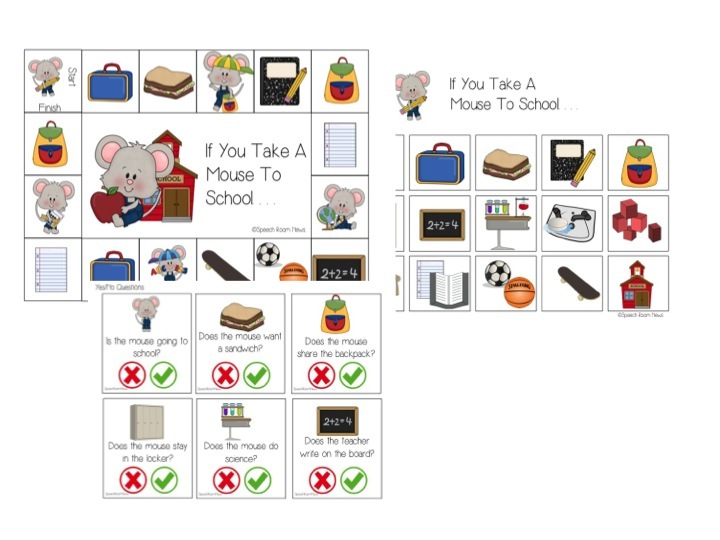 Page 6: Game Board: Use as a reinforcer for any learning target. Pages 7-9: Yes/No questions: Eighteen yes/no questions with picture cues. Page 14: Writing: Have the student write or draw about the mouse. Pages 15-21: Verb Crayons: Cut out all crayons and place them on the worksheet. Have the student identify the verb. He/she may keep the card if it is produced correctly. Page 22: Bring a pet. Write or draw what will happen if you bring a pet to school. Pages 23-25: Basic Concepts. Use the included cards to describe the positional concepts. Pages 26-27: Coloring Sheets. 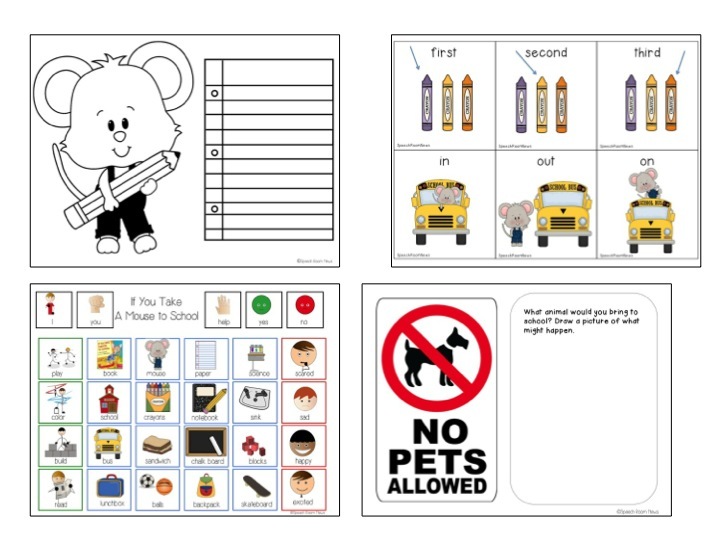 Use the two included coloring sheets as reinforcers or language activities. 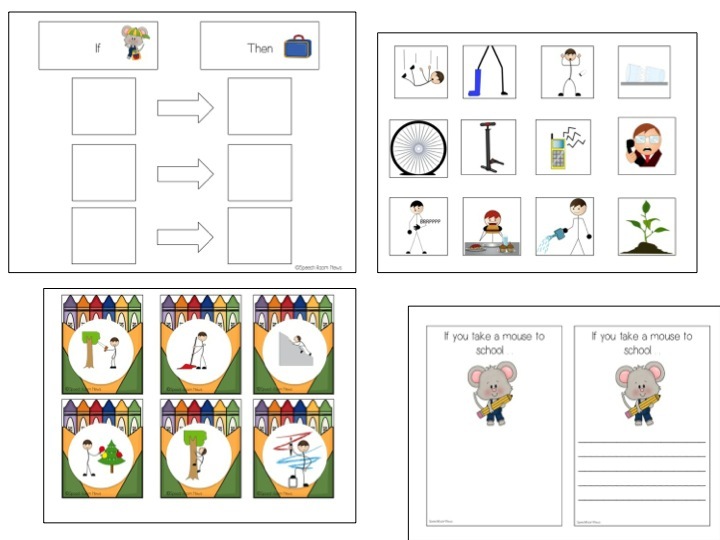 Page 28: Communication Board: Use with students as a reference when retelling or as a communication board for minimally verbal students. 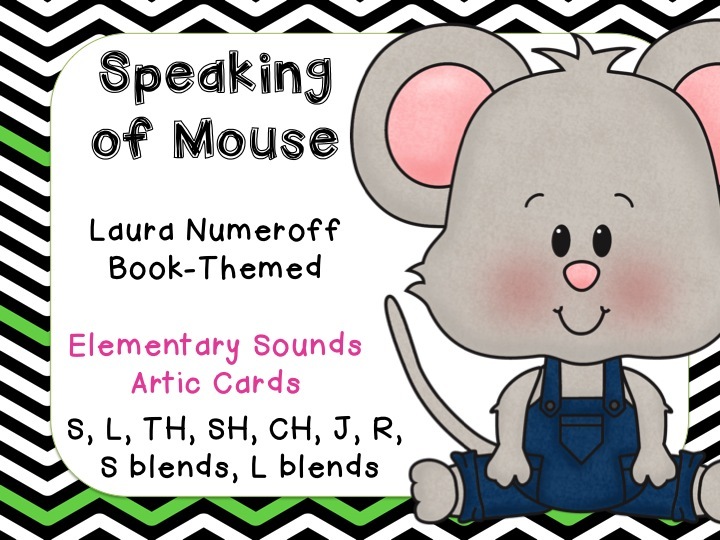 Pages 29-34: Describing/Attributes: Describe a mouse using the included worksheet with prompts/choices. 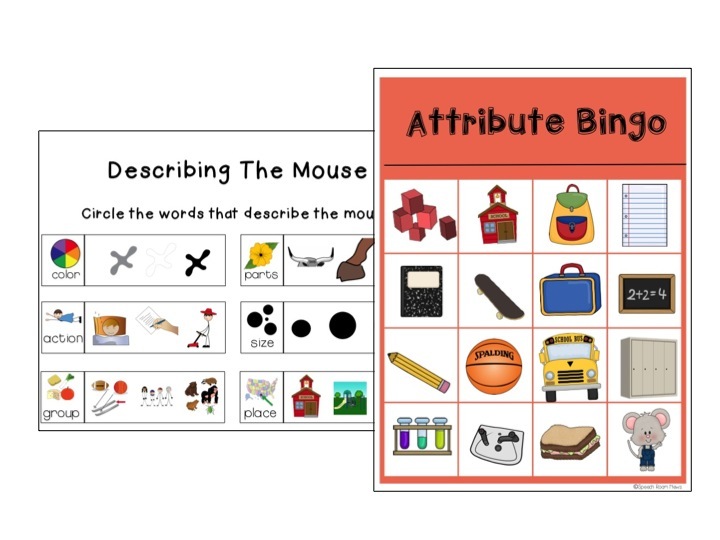 Play attribute bingo! Use the given calling cards and match objects on the cards. 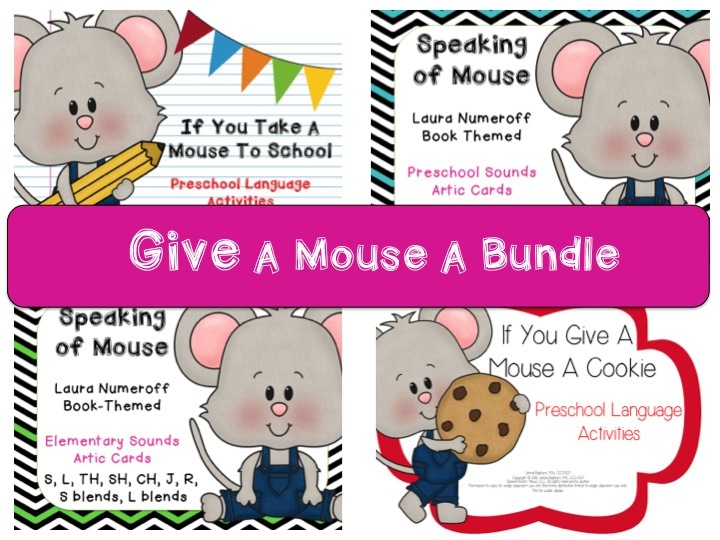 You can grab the Take A Mouse to School packet on TpT. To go along with the Mouse books I also made a great articulation companion. 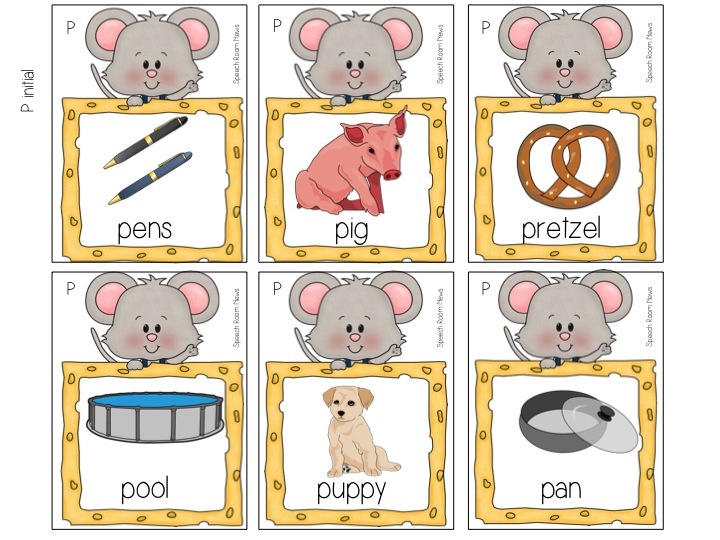 The articulation cards all feature the adorable mouse from Take a Mouse to School and Give a Mouse a Cookie. The Elementary version and Preschool version are both on TpT! If you’re interested in a bundle this is a great way to save some money! You can find the bundle in my store!